Okay. If you’re like me (and no, you don’t have to have a prehensile tail to qualify), you’re trying to figure out how to keep your interest level high enough to stay awake when the cameras pan Cleveland to begin tonight’s possibly deciding World Series telecast. One way to accomplish that is to fix yourself a really extraordinary breakfast, like I always do. This particular recipe celebrates the victory of the Hokkaido Nippon Ham Fighters in the Japan Series, as reported by Ren a few posts below, as well as whomever wins the US World Series in Cleve…land…zzzzz….slapppp!…oh, okay, I’m awake again, thanks sweetheart. mix one heaping tablespoon of cream cheese with a teaspoon of dried dill. Place in microwave for 30 seconds to warm and soften cheese. Mix dill and cream cheese with three or four tablespoons of sour cream. A dash of salt and pepper to taste. Blend well. Spread your pre-Colombianly flattened masterpiece with the cream, cheese and ikura mixture. Fold over. 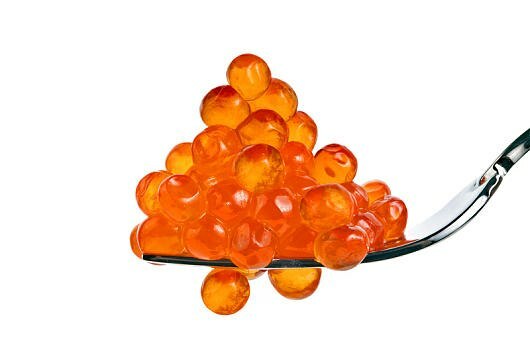 Sprinkle the top of the omelet with a few ikura pearls. This is more effective if you have the time and patience to build a little pyramid with them. Of course if you’re the type – like me – who really needs to buttress your attention span against spending two to three hours in Cleveland, even vicariously, you can find yourself a second tin of salmon roe and build a small replica of Devil’s Tower on top of your omelet instead. As an alternative, once you add your egg mixture to the pan you can immediately stir in the cream cheese, sour cream and salmon roe mixture and scramble it. This beats trying to face a day that will end in Cleveland with quotidian eggs and bacon, certainly, but I recommend the omelet approach for the discerning palate. Well, that certainly beats Fruity Pebbles. My culinary world is now much bigger. Your recipes ROCK! Getting a little tired of chipped beef!! !